KID: Hi, Santa! I'm back! KID: Brian! It's Brian! Don't you remember me from last year? And the year before? SANTA: Of course, of course! Brian! Hello, again! KID: I thought you knew everybody! Are you losing your memory, Santa? They say that's the first thing to go, you know, your memory. When you get old, I mean. Oh, older, I'm supposed to say older—and you are pretty older, right? I mean, I've seen pictures of you from a long time ago, and you already had the white hair in the pictures, so you're pretty old I bet, right? SANTA: Yes, well, you're a sharp one, aren't you, Brian? KID: Are those your real teeth? Cuz you drink all that soda. I saw it in those pictures and even commercials and I don't drink soda. That's okay that you can drink it because you're in charge of it and probably brush extra to make up for it which is what I would do but me I don't like soda and also it gives you cavities and stuff on your teeth and I need my teeth so that I can eat my steak. I like steak, so I don't drink soda but you drank a lot of it. Is that why you're so round? Not fat, round, I said. I'm not supposed to say fat. And also maybe you were always round, because you're Santa? SANTA: …What are you doing? KID: [ KID unclenches. ] There! I told myself to not forget about forgetting again! Or remembering, I mean. And the eyes. The eyes go, and then the memory. That's what my Mom says and she's always right. It made her sad when that happened to Grandma. My Dad—he says the first thing to go is the looks. Is looks the same thing as the eyes? Cuz you look with the eyes? I'm not sure. Sometimes grown-ups use words for things that aren't the names of them. Sometimes it's cool but a lot of the time it's confusing. When it does sound cool, I do it, too. It's still the wrong word, but it sounds cool and I know what I mean so it’s okay. You've got glasses. Do you know? Does looks means eyes? Or maybe you don't remember, because you're so old? SANTA: I would not have guessed. KID: —and that's fine by me because I really just don't need the hassle. Who needs the hassle? I don't. I don't need the hassle. My Dad says that a lot. But you know, maybe my parents will buy me one, even though I don’t need one, because my Mom says that we can certainly afford it. And it might be soon, because there's a clock ticking. I don't hear it, but I think grown-ups hear better than me. KID: What did you say, Santa? SANTA: I said, no doubt about it. KID: Yeah, so I know grown-ups don't ask Santa for their presents—Mom and Dad told me they ask each other because Christmas law and order says there’s an inspiration date or statue of eliminations or something? But if you did ask my Mom what she wants, I bet she'll say "another kid." But that's not what I want. I mean, I want Mom to get her present, but I don't want a kid, I don't need a kid. Who needs the hassle? Well, maybe a little brother for me, but a baby? I don't want a baby. I don’t need the hassle! But if Mom takes care of it, I guess it would be okay. Maybe that could be his name—Hassle! SANTA: Got it. But like you said, grown-ups don't come to me for their presents. The question is, what do you want? I'll bet you've got a list in your head, right? KID: Ask my Dad and he'll probably say "a time machine" because he says he wishes he had one a lot because there's these things he wants to do again, but different. Do-overs. Like, getting the condomininums. I heard him say he should have gotten the condominimums. KID: Right, condominimums. See, Dad said something to Uncle Rick—did you hear my air quotes? Cuz he's not my real uncle, but that's what we call him now—and I heard Uncle Rick made like a surprised "No way!" sound, so I paid attention to the rest and I don't get it all but Dad told about how if he just got the condominimums that one time everything would be different. And they were only a few dollars back then? He said "bucks" but like I said grown-ups use words for things that aren't the names of the things and I don't like the way "bucks" sounds and it's confusing. I guess it's shorter, so if you're in a hurry, maybe "bucks" is good for you, but I say "dollars" is definitely better. I like the the real word and besides, do you want to have a hundred boy deers? KID: Of course not! I sure don't, and—[ KID pauses to consider. ] Wait. Maybe you would, though, Santa, because with more deers you could go faster? A lot faster with a hundred bucks, right? But, see, I know I would definitely like a hundred dollars better. No bucks for me! And with a time machine Dad could zap back to old times and get the condominimums from Lincoln or Obama or whoever for a few dollars and then…? And then I guess he'd zap back to now and everything would be better because of having condominimums? Because when someone lands on one they have to pay you money, right? And I guess a lot of people would do that we'd be rich? Well, I'd still be Brian, but *we* would be rich, like having-profits-rich. Huh. Was the first person with a lot of money named Rich? Maybe in the Bible? I remember there's profits in the Bible. Is that why it's called being rich? Why are words so weird…? KID: Like…profits and rich. Dollars and bucks. Condominimums and condoms. Weird. KID: So, anyways…What *I* want? All the Lego is what I want. Lego. That's single-er and plural, did you know that? Lego. That means I can say "Give me that Lego" when I ask you to pass me just that one brick and I can *also* say…umm…"Look at that herd of Lego!" Is that confusing? But it's okay, because I love Lego. You can make it into anything else, so it's like when there's a story where you get to make a wish you should always wish for more wishes. That's Lego. *That* "Lego" was plural, in case you couldn't tell. And you know what? When I get all the Lego, I can build that new kid for my Mom and that time machine for my Dad! That's a good idea, isn't it? But I'll probably need those Lego robot sets and I haven't made any of them yet but I can learn them because I'm going to be a Master Builder and I can learn that. If you can't wrap up or bring *all* the Lego to my place then I think half the Lego is okay. That will keep me busy for a while, and anyway, I think we don't learn time machines until junior high. SANTA: Well! Sounds like you will be studying hard, Master Builder Brian! Lego it is! That's a favorite of mine. KID: Or—Those are favorites of yours! KID: Because I'm sharp! That's a good word. I'll definitely remember that one until I get so old that I forget it. I bet glasses will make me even more sharp! Glasses for my looks, I mean, not water glasses. See how weird are words? KID: So, can I stop being good now, or are you still watching right up til you deliver? KID: [ KID looks hard at Santa for a minute. ] Huh. You really do know, don't you? 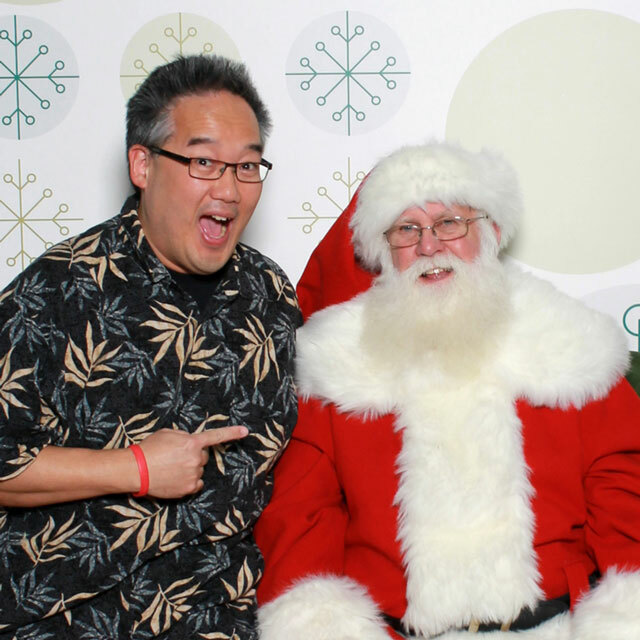 SANTA: Brian, it's about time for me to meet the next child in line. KID: Cool, Santa. Thanks for the Lego you're definitely going to get me. Just you can't tell anyone about my plans to build the new kid or the time machine for Mom and Dad, okay? Santa-patient confidentially. That's the rule, right? Christmas law and order! SANTA: Uh, yes. That's right. Exactly! KID: I'm sharp! Merry Christmas, Santa! SANTA: I'm going to take a break. SANTA: Yeah, I just need to…call my family. Check in. ELF: Got it. [ ELF walks back to the line and addresses waiting kids and parents. ] Santa needs to take a quick break, but he'll be back and ready for you in just a few minutes! KID: [ To PARENTS as they leave. ] Who asks Santa what he wants for Christmas?